As a Woodturner, I fully understand the difficulty of knowing what gear to purchase when you are starting out, or what is needed to progress in the never-ending 'learning turning' journey. Many tool manufacturers are now sending me tools to try on a constant basis. I will test them and give 100% honest feedback and suggestions for improvement if they are needed. Be assured that I only sell products that I have used myself and that have stood up to my rigorous turning approach. I am only too happy to share the knowledge that I have learned, so give me a call on +649 297 7051. You can also contact me at timberly@xtra.co.nz. Being a born and bred New Zealander, I have been exposed from birth to the awesome beauty of mother nature that all Kiwis freely enjoy. The amazing changing landscapes of this country and the diverse range of timbers available continue to inspire my woodturning. Such an environment fosters my innate passion and lifelong commitment to all things showcasing NZ wood. In recent years my work has evolved and my creations can now be viewed in terms of wood art. I am honoured to have many such pieces residing in notable collections worldwide. It has been said there is a high degree of skill and finesse in my work, yet the end result often appears light and free-flowing. These qualities invite the viewer in and allow one's eye to play, while the mind is left to wander and be inspired. I have travelled the woodturning world for the last ten years and mixed with many of the world's best turners learning new techniques which I have gone on to further develop and incorporate into my art. These techniques include carving, texturing, colouring and the study of correct form. I delight in stretching the boundaries of convention as can be seen in my winged vessel collection. A desire for innovation can be seen in my multi-axis, off centre, out-of-balance works. As a result of many years perfecting my craft, I have discovered that I gain great satisfaction from interacting and teaching. I have tutored at symposiums internationally in America, Australia, and extensively throughout New Zealand. In 2011 I was invited to demonstrate in Norway, England, and Europe as an international guest demonstrator. Additionally, my works have featured numerous times in woodturning books and magazines, and I am a regular contributor of articles for international woodturning publications. 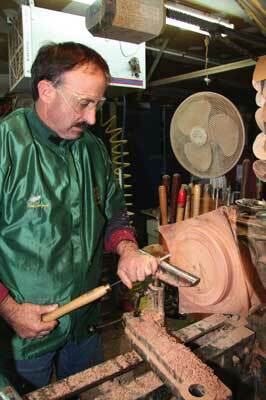 Tuition is available through the South Auckland Woodturners - Aoraki Training Scheme, refer to www.sawg.org.nz. Alternatively, you are welcome in my workshop for a one on one hands on learning experience at Hunua Road, Papakura. weekend. You won’t be disappointed." A track record of a standard of work that is excellent, interesting, inspiring and different. The ability to connect with the audience and to get the message across. If they can entertain as well, then that is an added bonus, but never one of our main focuses.